Editor's Note: Voting is under way for the 2010 CNN Hero of the Year. The winner will be announced at "CNN Heroes: An All-Star Tribute," which airs Thanksgiving night, November 25, at 8 p.m. ET. See the Top 10 CNN Heroes of 2010 and and cast your vote. 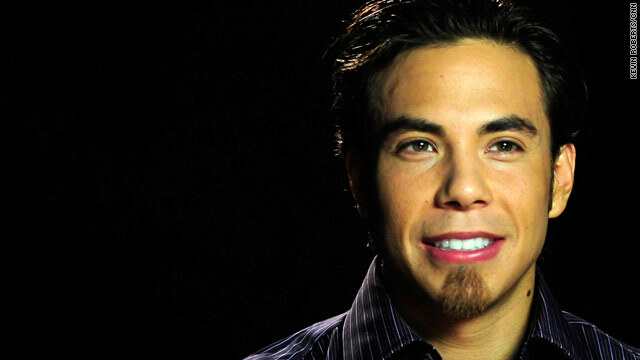 (CNN) -- Apolo Anton Ohno has won eight Olympic medals -- two of them gold -- in short track speed skating, but he is also well known for helping people away from the rink. Ohno is the spokesman for SeeYourImpact.org, a nonprofit organization that not only lets people donate directly to someone in need, but also e-mails them to show exactly how their gift is making a difference. Ohno has been involved with CNN Heroes this year, serving on the Blue Ribbon Panel that selected the Top 10 Heroes. He recently sat down with CNN Entertainment senior producer Denise Quan to talk about CNN Heroes and his philanthropy. Below are excerpts from that interview. Denise Quan: How did you come to be involved with SeeYourImpact.org? Apolo Anton Ohno: SeeYourImpact.org was first brought to me by a close friend who has been involved with philanthropic work for many years, and he said, "Apolo, I know you are involved with a lot of different charitable organizations, but this is one that can help change billions of lives around the world." I was always interested in affecting the lives within my community, and this is something that is the future of philanthropic giving, so I was very excited about it. At the end of the day it doesn't matter how much money you've made or how much money you are going to make, but how you can give back. Utilizing my success for a positive benefit, to help others, is something that really interested me. Quan: So what exactly does SeeYourImpact.org do? How does it work? Ohno: You go to the website and pick a geographic region and cause that we want to focus on. So let's say I want to focus on an area in India and I want to focus on malnutrition or running water. And I would say, "I want to help this family out for the next six months and I want to donate this amount of dollars." One hundred percent of the donations go directly toward the people who receive the gift, and ... within two weeks, you receive a picture of the family and a story about how it has impacted their lives. In the business of giving, people want to see how their money is being used and how it is going to affect the families, and this is a perfect and wonderful opportunity to be a part of that change for the greater good. You hear fantastic stories about Bill Gates, Warren Buffett and a lot of other people who give money towards these amazing charities, but there are really thousands of ways where everyday people can donate -- even if it is a very small amount of money -- and help someone else who is in need. Quan: Has your work with SeeYourImpact.org changed you? Ohno: It has really inspired me to be a better person. It's a way for me to constantly stay motivated to know there are other people out there who don't have the same resources or the same opportunities that I do. And it's up to me to be able to make sure that they can have something better. At the end of the day, it's things like SeeYourImpact.org and CNN Heroes that really are what life is really all about. Quan: So how did you become involved with CNN Heroes? Ohno: I was asked to be a part of the Blue Ribbon Panel that selects the Top 10 Heroes of the year. And I had watched "CNN Heroes: An All-Star Tribute" in the past, and it's a very popular show because it captures human emotion and spirit and it shows people doing extraordinary things for others. So it's an amazing opportunity for me to be a part of it, and it's an honor as well. Quan: So what's it like to select the Top 10 Heroes? What qualities did you look for? Ohno: To be honest with you, it was very difficult to choose. If I could give out an award to every single one, I would. But I think your own personal beliefs, causes and life's journey is what you kind of gravitate toward, so that's how it was with me. I was drawn to people who I could sort of sympathize with and understand why they are doing something or working toward this cause as opposed to another. I did a lot of the due diligence and research myself, alone -- hours just reading about the causes, the people involved and how they impacted lives. It made me happy to know that there are people out there who have really dedicated their lives toward helping others. It's pretty amazing to really see someone doing that. Quan: What is a hero to you? Ohno: I think a hero to me is someone who defies odds, who follows their own dreams and passions but also does something extraordinary and has dedicated their life toward something that's different -- helping others. And that's why these CNN Heroes are so amazing to me. To see them and to see exactly what they're doing and how they're impacting lives, that is a hero to me. It truly is. And it inspires me to want to be a better person.